After having a smartphone in our hands, mobile apps are not only an entertainment for all of us but they are taking care of us too. From the calories count to heartbeat count healthcare mobile apps are giving you a complete report on your health. They are helping, they are guiding, and they are taking care of us. Mobile apps on healthcare is a completely next level of development of technology. Once a wise man said “Health is wealth”, it’s completely useless if are having millions of dollars and you have only a few days to live. So, having a flagship phone it will not matter much but having a healthcare app matters for your health. Healthcare apps have played a vital role till date with many features and let’s take a look about the advanced features that getting ready for you on 2K19. The trend of healthcare has completely changed after the entry of wearable devices. Wearable devices will help to collect the necessary data of your health and will give you a complete report on your health condition just like a virtual doctor. The trend for wearable devices like fit bits, smart watches, and trackers has taken a massive adoption in this digital world. The 2K19 will be running towards more healthcare wearable sales and is expected to grow to around 4.4 billion U.S. dollars globally. After the quick mobile apps development, the healthcare industry has benefited the most because it’s not that easy to get an appointment with the topmost doctors these days but after the app development it’s very easy and quick to consult a doctor for an emergency it takes fractions. This going to be a good turn in the healthcare industry in the future also. The technology we stepped in this year is Artificial intelligence for mobile. But the artificial intelligence for the mobile apps will give you revolutionary trends for the next generation. This AI pairing with the healthcare mobile app can lead you to handle patient diagnosis, disease monitoring, and health analysis and risk predictions also. Research studies say that the mHealth market accounted for over $23 Billion in 2017 and is projected to grow upwards still. So, we can expect the next level of features in next year. Telemedicine is a virtual doctor which can give all the prescriptions, pills details and medical expertise by 24/7 from the pin to pin detail like time to take food, time to take pills and all. Patients will get medical check-ups, prescriptions and medical tablet details and all without a doctor consult. The app is providing first aid for the diseases, injuries and seizures. Healthcare firms are just facing issues regarding protecting patient data securely. Blockchain will help with cryptographic procedures. With the help of Blockchain encryption and advanced protection, the patient data and medical reports will be kept secure. Blockchain helps the user to send the data from one network to another network with high security. These are not all. 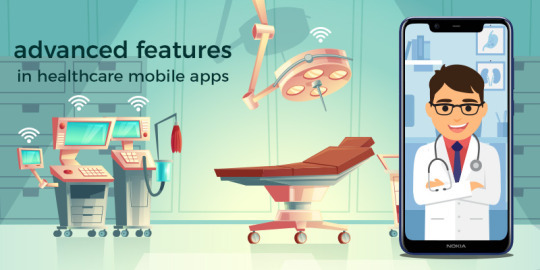 There are many advanced technologies that have come together to form the list of healthcare mobile apps 2019 a standout amongst the most exciting year for Healthcare mobile app development companies. And these are the trends that which took place in 2K19 and there are some trends just running now for better and easy healthcare. The electronic records and cloud solutions for the easy storage of patient’s data. Card and mobile payments for easy payment methods are going good in the digital world. So, let’s wait and see what more brings 2K19 to the healthcare industry for us.